This Asian coleslaw recipe is very simple and refreshing. Healthy coleslaw is the perfect way to finish off a meal. It’s also a great accompaniment for fish or steak, or by itself as a snack. If you don’t like the Asian twist, here is my traditional coleslaw recipe. It’s difficult to make coleslaw without mayonnaise, but this recipe fits the bill! It’s a healthy coleslaw. 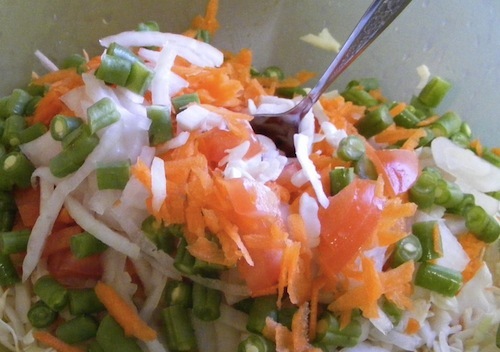 Mix together the veggies – cabbage, onion, tomato, carrot, beans/cucumber. In a separate bowl, make the dressing – mix the lime juice, lemon juice, chili powder, cumin, sugar, and salt and pepper. Add as much dressing as you like – I used it all. Serve alone or with cheese and ENJOY! Because this is a coleslaw without mayonnaise, it definitely has a different taste to it – but it’s a good variation on a classic, I think. I hope you try it out.